Arsenic in groundwater and its accumulation in plants and animals have assumed a menacing proportion in a large part of West Bengal, India and adjoining areas of Bangladesh. Because of the tremendous magnitude of the problem, there seems to be no way to tackle the problem overnight. Efforts to provide arsenic free water to the millions of people living in these dreaded zones are being made, but are awfully inadequate. In our quest for finding out an easy, safe and affordable means to combat this problem, a homeopathic drug, Arsenicum Album-30, appears to yield promising results in mice. The relative efficacies of two micro doses of this drug, namely, Arsenicum Album-30 and Arsenicum Album-200, in combating arsenic toxicity have been determined in the present study on the basis of some accepted biochemical protocols. Arsenic contamination has assumed an alarming proportion in some 9 districts of West Bengal, India, so much so that it has been earmarked as "the biggest arsenic calamity in the world" [1, 2]. In view of rapid spread of various diseases arising out of arsenic contamination (e.g. arsenical dermatosis, melanosis, keratosis, oedema, gangrin etc.) in different areas of West Bengal and also in adjoining areas of Bangladesh [1–4], some effort has been made to provide arsenic-free drinking water (purified through chemical plants) to people living in the arsenic-contaminated zones, but this has proved to be grossly inadequate so far. From the vastness of the problem and new reports of arsenic contamination still emerging from other parts of South East Asia [5–7], Slovakia , Mexico  etc., a disastrous situation seems to loom large unless a tremendous all-out effort is urgently made to bring the situation under control. The problem became more complex because of the poor health and hygiene conditions and the relatively low affordability of the greater majority of population living in these zones. and for the lack of awareness of the possible consequences of arsenic intoxication in most of them. Mainly with such a background, our initial aim was to find out suitable antagonists of arsenic poisoning, which should be i) easy to administer, ii) effective in low doses, iii) inexpensive and iv) without any toxic effects of their own. In course of our search, a potentized homeopathic drug, Arsenicum Album-30, was indeed found that showed highly promising results in combating arsenic intoxication in mice, in regard to a series of accepted scientific protocols used, such as cytogenetical, histopathological and biochemical [10–16]. Encouraged by the positive results obtained in these studies, and also of others , changes in activities of certain toxicity marker enzymes like alanine amino transferase (ALT, EC.2.6.1.2, also known as glutamate pyruvate aminotransferase) and aspartate amino transferase (AST, EC 2.6.1.1, also known as glutamate oxaloacetate aminotransferase) and changes in the level of reduced glutathione (GSH) in liver and blood tissues of mice, if any, have now been determined at different periods after single injection of arsenic trioxide. The present investigation also aims at ascertaining if oral administration of either of two micro doses of the homeopathic drug, Arsenicum Album, namely, Arsenicum Album-30 (henceforth to be called Ars Alb-30) and Arsenicum Album-200 (henceforth to be called Ars Alb-200) can ameliorate arsenic toxicity by bringing about positive modulations of these toxicity denoting parameters. Inbred lines of Swiss albino mice, reared in the animal house of the Department of Zoology (under supervision of the Animal Welfare Committee), Kalyani University, West Bengal, India served as the materials of the present study. Healthy mice, about 3 to 4 months old, and weighing between 20 and 25 gm, were used. Mice were intoxicated only with a single dose of 0.1% As2O3 solution @ 1 ml/100 gm body weight by intraperitonial injection (on day 0). A group of such Arsenic intoxicated mice were subsequently fed (post-fed) either potency of the homeopathic drug, Ars Alb-30 or Ars Alb-200 (two commonly available and frequently used potencies in India), every day till sacrificed as stated below. Two potencies of the homoeopathic drug Arsenicum Album, namely, Ars Alb-30 and Ars Alb-200, respectively, were prepared as per homoeopathic procedure of dilution and potentization by Hahnemann Publishing Company (Hapco), 165, Bepin Behari Ganguly street, Calcutta, from where it was procured. As per the standard procedure indicated in the Homoeopathic Pharmacopoeia of India, Vol. I, 1 ml of original metallic salt solution (Mother tincture prepared from A. R. quality Arsenic trioxide (powder) completely dissolved in a mixture of glycerine, H.P.I/I.P., strong alcohol, H.P.I. and purified water, H.P.I. the required amount of alcohol) is diluted with 99 ml of rectified spirit (90% ethyl alcohol approx.) and given 10 machine operated, moderate, equal and successive jerks (i.e. "succussions" through the standard procedure practiced for preparation of homeopathic potencies by Hapco) to produce the potency-1. Similarly 1 ml of the drug solution at potency-1 is again added with 99 ml of 90% ethanol and 10 jerks given to produce potency-2 and in this way by successive potentization, the 30th and 200th potencies of Arsenicum Album (Ars Alb-30 and Ars Alb-200, respectively) were produced (centesimal dilution). Similarly, alcohol-30 (A-30) and alcohol-200 (A-200) were potentized from rectified spirit (approx. 90% ethyl alcohol) by successive jerks and dilution procedure. 1 ml each of Ars Alb-30, Ars Alb-200, A-30 and A-200 were finally diluted separately with 20 ml of double distilled water to make the stock solution of Ars Alb-30, Ars Alb-200, A-30 and A-200, respectively. Each mouse, either normal or arsenic intoxicated, was orally fed with the aid of a fine pipette, 1 drop (0.06 ml) of stock solution of either A-30 (alcohol treated positive control 1) or of Ars Alb-30 (active drug treatment 1) or of either A-200 (positive control 2) or Ars Alb-200 (active drug treatment 2), as the case may be, at a time. The drug or alcohol feeding was made as follows: 2 hr after injection of As2O3 and thereafter 2 hourly, a total of 4 times on the day of injection (only during day time starting from day 0) followed by thrice daily (six hourly; at 6 a.m., 12 noon and 6 p.m.) on subsequent days till they were sacrificed for analysis of enzymes and reduced glutathione content at longer intervals. For each individual group under treatment and control series, 5 mice were used for each fixation time (i.e. at 24 h, 48 h, 72 h, 7 d, 15 d and 30 d). The fixation times were selected from our previous experiences on the effects of Arsenic trioxide in time-course studies carried out in mice by taking into consideration various cytogenetical (namely, chromosome aberrations, micronuclei and other nuclear anomalies, sperm head anomalies etc.) and biochemical parameters (namely, protein profiles, acid and alkaline phosphatases, lipid peroxidases, DNA and RNA contents, etc) other than the present ones. The observations were cross-checked as per the blind checking method (observer not permitted to know if the sample was from drug fed or un-fed mice) from indexed cuvettes later deciphered to avoid possibility of bias in scoring data. Indexing of samples was done by one who was not within the team of observers. This group of mice were injected intra-peritonially with a single dose of 0.1% As2O3 solution @ 1 ml/100 gm body weight. This group of arsenic intoxicated mice were post fed with either of the potentized homeopathic drugs – Ars Alb-30 or Ars Alb-200 at the above mentioned dose and time till sacrificed. This group of arsenic intoxicated mice were post fed either with A-30 or A-200 at the corresponding time and dose till sacrificed (positive controls for drug-treated series as the 'vehicle' of the drug was ethyl alcohol). At an average a mouse consumed between a total of 0.003 ml (twice daily group) to 0.006 ml (4 times a day) of ethyl alcohol (90%) diluted in distilled water everyday. Normal untreated mice were fed with either alcohol-30 (A-30) or alcohol-200 (A-200) at all the corresponding intervals as that of the other drug-treated series. This series was maintained for examining if the feeding of only succussed alcohol brings forth any modulations of enzyme activities. Normal healthy untreated mice were orally administered with either of the potentized homeopathic drug, Ars Alb-30 or Ars Alb-200 at the same dose and frequency as that of the As-intoxicated plus Ars Alb-30 or Ars Alb-200 fed mice. These groups were maintained to examine if the feeding of the drug alone could bring forth certain changes in their enzymatic activities. This group of normal mice were injected with double distilled water @ 1 ml/100 gm body weight. This group served as the negative control for arsenic intoxicated group as arsenic was dissolved in water. This normal group of mice were maintained along with the other treated groups, and not injected with anything. But as there was practically no difference between Dw injected and normal untreated control, data of only Dw-injected series have been provided. Assay of two enzyme protocols, viz., determination of AST and ALT activity and estimation of the level of an effective toxicity marker compound, glutathione, in reduced form (GSH), were made. For assay of ALT and AST the methods of Bergmeyer and Brent  was followed with some minor modifications. For the analysis of ALT, 0.1 ml of tissue homogenate was made to react with 0.5 ml of the substrate solution (L-alanine) and incubated for 30 minutes at 37°C. This was followed by addition of 0.5 ml of dintrophenolhydrazine (DNPH) and then by 5.0 ml 0.4 N NaOH. The absorbance was measured at 510 nm. The enzyme activity was determined from the standard curve drawn using sodium pyruvate as standard solution. The enzyme activity was expressed as micromol of pyruvate formed per minute/mg protein (determined by the method of Lowry et al ). For AST 0.1 ml of tissue homogenate was made to react with 0.5 ml of the substrate solution L-asparate and was incubated for 60 minutes at 37°C. The absorbance was measured at 510 nm. The reduced glutathione level was determined by the method of Ellman . 0.02 ml of the sample was added to 9 ml of distilled water. Then 1 ml of phosphate buffer (pH 8.00) was added. 0.02 ml of reagent [Dithiobis(2-nitrobenzoic acid)] was added to 3 ml of this solution. The absorbance was determined at 420 nm against blank, where the reagent had not been added. The concentration of GSH was expressed as nmole (SH) per unit tissue. The levels of significance of the data were determined by Student's t-test by comparing the data of different treated and their individual and respective control series, i.e. between any two series, e.g. between drug fed and Dw-fed series, or between drug-fed and Alcohol fed series. The main null hypothesis was As + Dw was not equal to As + Ars Alb 30 or As + Ars Alb 200. The ALT activity in As-treated series was found to increase at all intervals, as compared to that of Dw-controls (Fig 1). There was a suppression of this increase from 72 hr onwards in As + Ars Alb-30 group (p < 0.05), while the increased enzyme activity appeared to be consistently suppressed at all the fixation intervals in the As + Ars Alb-200 group (p < 0.01). However, when normal healthy untreated mice were fed either Ars Alb-30 or Ars Alb-200 alone, the enzyme activity was apparently similar to that of Dw-controls. Similarly, in normal healthy mice only fed either A-30 or A-200 alone, there was no appreciable increase or decrease of enzyme activity as compared to that of Dw-fed controls. 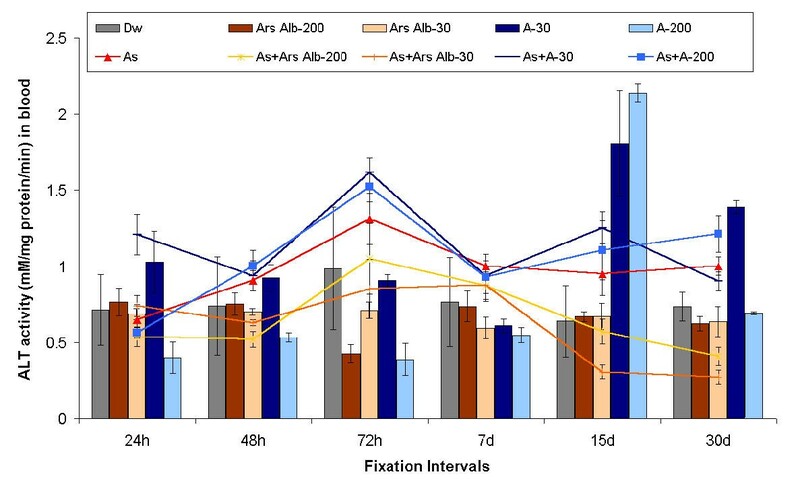 But interestingly enough, there was no palpable suppression of increased enzymatic activity at most of the fixation times in either As + A-30 or As + A-200 group (see Fig 1). Showing ALT activities (μ/Mmg protein/min) in liver of different groups of mice at different time intervals. 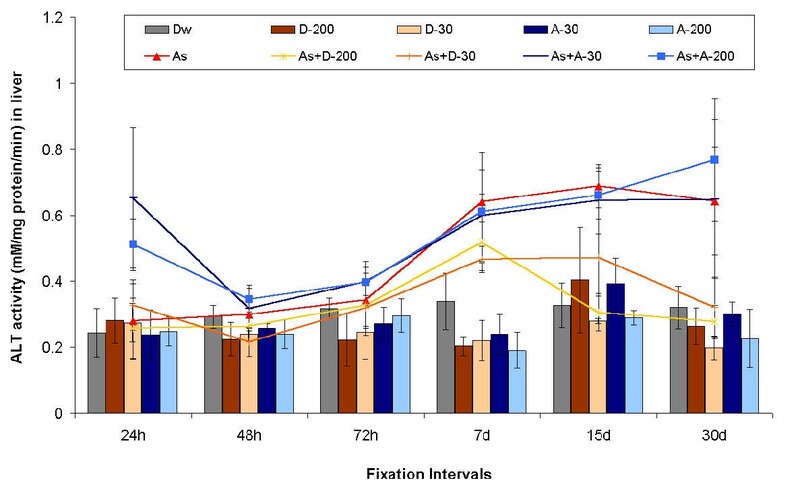 The ALT activity in blood of As-treated mice appeared to increase at all the fixation intervals as compared to that of Dw-controls except for 24 hr (Fig 2). In As + Ars Alb-30 group of mice, there was a clear suppression of this increased enzyme activity (p < 0.01-0.001) at all the fixation times except for 24 h as compared to As-treated mice. The same was true in As + Ars Alb-200 group (p < 0.01) at all fixation intervals. In Ars Alb-30 or Ars Alb-200 group of mice, there was no significant change in mean activities of ALT in either liver or blood, as compared to that of Dw control. 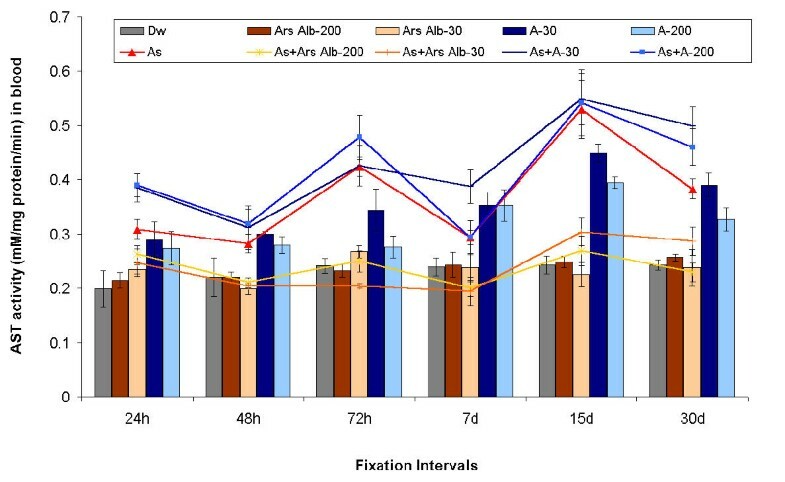 However, conflicting results were obtained when either A-30 or A-200 was fed to normal mice; while there was an increase in enzymatic activity in blood of mice fed A-30 at most fixation intervals (except for 7 day), there was an appreciable increase (p < 0.01) of the enzyme activity in mice fed A-200, as compared to that of Dw-fed controls (p < 0.01-0.001, except at 15 d). Interestingly, on the other hand, there was a rise in enzymatic activity in As + A-30 or As + A-200 group of mice at most fixation intervals (except at 24 hr in case of As + A-200) as compared to As-intoxicated mice, indicating stimulating/synergistic effect of alcohol on As-intoxication (see Fig 2). Showing ALT activities (μ/Mmg protein/min) in blood of different groups of mice at different time intervals. The mean activities of AST were found to increase in AS-treated group at all fixation intervals, as compared to that of Dw-controls (Fig 3). The maximum increase was found at 7d. 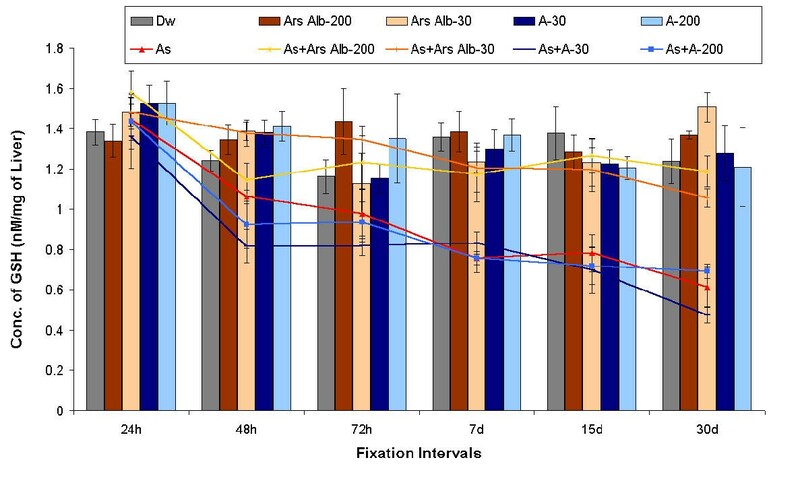 In As +Ars Alb-30 or As + Ars Alb-200 mice, there was a clear suppression of this increased enzyme activity at most fixation times (p < 0.05-0.01) as compared to As-treated mice. When normal healthy mice were either fed Ars Alb-30 or Ars Alb-200 individually, there was no significant change in their enzyme activity as compared to that of Dw-controls. However, in As + A-30 or in As + A-200 mice, there was an apparent increase in AST activity at most fixation intervals (except at 24 hr and 30d) as compared to As-treated mice. Again, in A-30 or A-200 group, only a marginal increase in AST activity was observed (see Fig 3) as compared to Dw-control. Showing AST activities (μ/Mmg protein/min) in liver of different groups of mice at different time intervals. The mean activities of AST were elevated in blood of As-treated mice at all fixation intervals, as compared to that of Dw-controls. 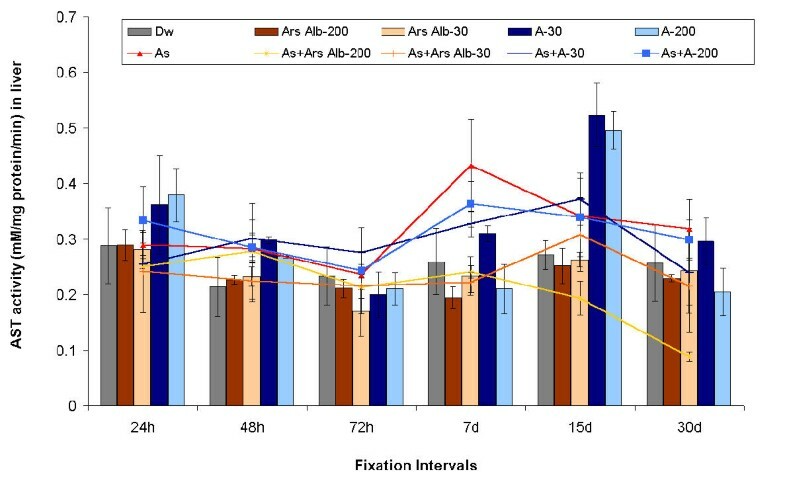 In either As +Ars Alb-30 or As + Ars Alb-200 group, there was a distinct suppression of this increased AST activity at all fixation times (p < 0.01-0.001). In Ars Alb-30 or Ars Alb-200 group, there was no significant change in their enzymatic activity as compared to either Dw-control. But the feeding of A-30 or A-200 alone to normal mice led to the increase in AST activity at most fixation intervals, as compared to Dw-control. On the other hand, a rise in enzymatic activity was observed at most fixation intervals in As + A-30 or in As +A-200 group of mice as compared to As-treated mice (see Fig 4). Showing AST activities (μ/Mmg protein/min) in blood of different groups of mice at different time intervals. The mean level of GSH was found to be decreased in the As-treated series at all intervals of fixation, as compared to that of Dw-controls. 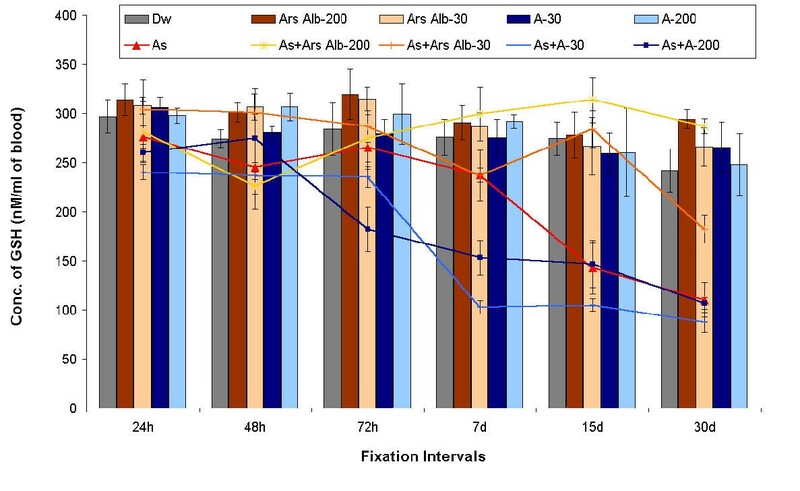 In As + Ars Alb-30 or As + Ars Alb-200 mice, there was clear evidence of prevention of this decrease of GSH level at all fixation times, as compared to that of the As-treated series (p < 0.05-0.01). On the other hand, there was no significant change in the GSH level in Ars Alb-30 or Ars Alb-200 group, as compared to that of Dw-controls. However, there was a decrease in GSH level in As + A-30 or As + A-200 at all intervals of fixation, like that observed in As-treated mice. On the other hand, in A-30 or A-200 mice, no significant change in GSH level could be observed, as compared to that of Dw-controls (see Fig 5). Showing GSH content (nM/mg) in liver of different groups of mice at different time intervals. The GSH level in blood of As-treated mice appeared to decrease at all fixation intervals, as compared to that of Dw-controls. In As + Ars Alb-30 or As + Ars Alb-200 group, there was a spectacular prevention of decrease in GSH level at all intervals of fixation (p < 0.05-0.001), as compared to that of As-treated mice. In either Ars Alb-30 or Ars Alb-200 mice, there was no visible change in their GSH level, as compared to that of Dw-controls. In A-30 or A-200 group, there was no appreciable change in GSH level either with regard to Dw-control. On the other hand, appreciable amount of decrease in GSH level was noted in As + A-30 or As + A-200 group at most fixation times, similar to what was encountered in As-treated series (see Fig 6). Showing GSH content (nM/ml) in blood of different groups of mice at different time intervals. In our earlier studies, liver appeared to be one of the major organs in which arsenic caused considerable damages, tissue necrosis and other histological as well as biochemical changes [10, 11], [14, 15]. Liver damage as a consequence of arsenic poisoning has also been reported in human subjects . Determination of the enzymes AST and ALT is the most common means of detecting liver damage, the enzymes being raised several fold in the first 24 hr after damage . However, there are a number of other toxicity denoting compounds, of which reduced glutathione (GSH) is one. This compound plays a protective role by detoxifying substances in one of the three ways, namely, i) conjugation catalyzed by a glutathione transferase, ii) chemical reaction with a reactive metabolite to form a conjugate, or iii) donation of a proton or a hydrogen ion to reactive metabolites or free radicals, respectively . It has been suggested before  that reactive intermediates can react with GSH either by a direct chemical reaction or by a glutathione transferase mediated reaction. If excessive, these reactions can deplete the cellular glutathione. Also, reactive metabolites can oxidize glutathione and other thiol groups, such as those in proteins and thereby cause a damage in thiol status. When the rate of oxidation of glutathione exceeds the capacity of glutathione reductase then oxidized glutathione (GSSG) is actively transported out of the cell and thereby lost. The reduced glutathione may be removed reversibly by oxidation or formation of mixed disulfide or protein and irreversibly by conjugation or loss of the oxidized form from the cell. Thus after exposure of cells to any compound such as As2O3 which causes oxidative stress, glutathione readily conjugates to reduce the cellular GSH level. Therefore, the role of glutathione in cellular protection means that if depleted of glutathione the cell is more vulnerable to toxic compounds. Further, the modification of thiol groups of enzymes, such as by As2O3 and other heavy metals, often leads to inhibition of this enzyme function, as noted in the present study. Such enzyme also may have critical endogenous roles such as regulation of ion concentration, active transport or mitochondrial metabolism. There is evidence that alteration of protein thiols may also be a crucial part of cell injury. From the results of the present study, it was clearly demonstrated that arsenic treatment induced toxicity in mice as evidenced from the alterations in the enzymatic activities of AST and ALT and the reduced glutathione level in both liver and blood. It was further shown that only potentized Alcohol, i.e A-30 and A-200, tended to enhance the toxicity induced by As-treatment while the potentized drugs, Ars Alb-30 and Ars Alb-200 (potentized in the alcohol "vehicle"), clearly showed protective effects. Of these two potencies, Ars Alb-30 appeared to be almost equally effective as that of Ars Alb-200 in bringing about positive modulation of these enzymes, but the Ars Alb-200 apparently had marginally better efficacy at 7d and at subsequent longer fixation times. Incidentally, intraperitoneal injection of serial dilutions of arsenic compounds (arsenicus anhydride), mainly in decimal potencies, have earlier been reported to increase arsenic elimination in varying amounts from blood of arsenic-intoxicated rats through urine and faeces [17, 23–25]. However, in our present study, another mammalian model, mice have been used. We have not only used a different route of administration (oral) of the centesimally potentized homeopathic drug, prepared from arsenic trioxide, but we also dealt with a large number of parameters and endpoints, starting from the actual deposition of arsenic in different tissues, to genotoxic, to histological, to enzymatic changes etc. in vivo at many more intervals before fixation (10–11, 14–15), which helped us to understand both early and relatively long-term effects of the potentized homeopathic drug, Ars Alb-30 and Ars Alb-200, which in every occasion most convincingly showed an ameliorative (and persistently combating) effect against arsenic poisoning as compared to the respective controls. Recently, Rey  produced evidences that the ultra-dilutions also contain initial properties of original salts which can alter chemical and biological properties. They demonstrated that despite their dilution beyond the Avagadro number, the emitted light from ultra-dilutions of lithium chloride and sodium chloride was specific of the original salts dissolved initially. In the present study also, the positive modulations in the levels of activities of ALT and AST enzymes and reduced glutathione in the potentized drug-fed mice could be clearly demonstrated when the results of the As-treated series were compared with the various control groups where the drugs were either not administered to As-intoxicated mice, or administered to healthy As-untreated controls. It is quite amazing that such microdoses of a potentized homeopathic drug, Arsenicum Album, which is produced by the dilution and succussion of the toxic substance (As2O3) itself, were capable of bringing about such enzymatic alterations in mice treated with a toxic dose of As2O3. Both Ars Alb-30 and Ars Alb-200 apparently had the ability to detoxify arsenic induced toxicity in both liver and blood. Incidentally, the metabolic processes through which these enzymes are formed and regulated, are strictly under control of certain genes, which are activated or deactivated at certain physiological conditions of the cell. Therefore, any sudden change in the genetic regulatory mechanism may be a cause or a consequence of the entry of the toxic compound, As2O3. As the potentized homeopathic drug, Ars Alb-30 or Ars Alb-200, is not expected to contain even a single molecule of the original drug substance (As2O3), or is expected to carry any other macromolecule, it is rather difficult to explain the mechanism as to how these potentized homeopathic drugs could render amelioration to the As-toxicity. The pathway through which the potentized homeopathic drugs execute their combating action can also be hardly followed after it is administered on tongue of the animal. Therefore, it becomes imperative that any attempt to explain the mechanism of action of the homeopathic drug would be highly speculative at the present state of our knowledge. In one such effort, Khuda-Bukhsh  advocated a hypothesis based on many circumstantial scientific evidences and logic that one major pathway of potentized homeopathic drugs could possibly be through regulation of expression of certain relevant genes. More and more evidences are being accumulated signifying validity of this hypothesis [28–31]. Recently, Wiegant and his collaborators [32–34] demonstrated the ability of low concentration of a toxic chemical (sodium arsenite) or "heat-shock" to produce "hormetic" effect in cells. According to these authors, "hormetic effect" produced in the cells exposed to the low dose, aroused certain protective activities that either reduced or helped in protection or speedy recovery of the cells when they were exposed to much stronger degree of such a stressful condition or to toxic chemicals. They also showed that there were positive changes in the m-RNA activities in generating molecular chaperones like hsp proteins in response to artificially induced stress conditions. Evidences of the presence of some early response genes (ERG) which act in a fast and transient manner in response to different physical, chemical or environmental stresses, have also been on record . These genes become active whenever living system is challenged with some kind of physical or chemical insult or stress, in a bid to combat the stress-related damage, either by activating or silencing the expression of some other sets of genes. It is therefore quite probable that As-intoxication deranges the activity of certain house-keeping genes (e.g. the genes responsible for synthesizing enzymes necessary for normal maintenance of cells and to detoxify cellular environment, as and when necessary). The ERG may also become active initially as a response to protect the cellular environment. While these ERG can protect cells from damage caused by low concentration of toxic substances (up to a certain limit) and eventually succeed in developing greater capabilities within cells to tackle subsequent "shock" or "insult" by greater dose of the toxic substance, they eventually fail if and when the dose or level of toxicity goes beyond the threshold limit. The administration of Alcohol-30 or Alcohol-200 (the blank "vehicle") was unable to restore the damage induced by As-intoxication. On the other hand, the success of the potentized homeopathic drug towards restoration of normalcy to a considerable extent in levels of enzyme activity and reduced glutathione level after As-toxicity would indicate that the drug could somehow be able to effectively modify or correct the gene functioning related to the synthesis and release of these enzymes and compounds with an ameliorative effect in correct proportions, which the succussed alcohol without medicinal property failed to do. Therefore, the potentized drugs contained in them definite signals which were apparently missing in the succussed alcohol. Indeed, a considerable amount of data so far accumulated tend to show that homeopathic drugs do have abilities to bring in noticeable protective changes at certain physiological and cytogenetical levels, which are known to be strictly under genetic control [27, 29–31]. As for example, the homeopathic drugs have been shown to be capable of repairing DNA damage or chromosome damage induced by X-irradiations [35–37], or by chemical mutagens  or by ultrasonic sound waves . Incidentally, the entire mechanism of repair of DNA in such cases is known to be controlled by certain genes (e.g. genes like uvr A, uvr B and uvr C having exonuclease activity and also XPA,.XPB, XPC, XPD genes etc. in mice having direct repair action through damage recognition and DNA binding). Therefore, there must be some definite link between the homeopathic drug and the responsible genes at some level. The same conclusion is arrived at when potentized homeopathic drug clearly shows ameliorative effects on the incidence of p-DAB induced liver tumors [29, 30], which must involve a restrictive mechanism on the conversion of the proto-oncogenes to oncogenes for effective tumorigenesis. Therefore, in the absence of any original drug molecule, all that these potentized homeopathic drugs can really do is to emit certain corrective signals which, when perceived by relevant receptors , can either activate or deactivate certain genes. They must get the required work done through the help of mechanisms that must be already operative in the living organisms, either by accelerating or by inhibiting certain intrinsic systems in operation. Thus, signal transduction pathway(s) and different steps at which eukaryotic genes are known to be regulated, say, at the trancriptional, translational level, or post-tranlational level, etc. are some areas of future research that can prove to be rewarding in understanding the molecular mechanism(s) of the potentized homeopathic drugs. Incidentally, the evidence that potentized homeopathic drug failed to elicit the desired effect when Actinomycin D, a transcription blocker, was simultaneously fed, also speaks in favor of the fact that homeopathic drugs need transcription process to go on for effective functioning [13, 28]. Recently, the gene products of p53 (a tumor-suppressor gene) and Bcl2 (an apoptotic gene) have been measured through immuno-blot (Western) experiments in two groups of mice undergoing carcinogenesis, one regularly fed a potentized homeopathic drug, and the other not fed with the drug (Khuda-Bukhsh, Biswas et al., unpublished data). There was clear evidence from the initial study that the homeopathic drug indeed positively influenced the expressions of these two individual genes in the mice undergoing the process of carcinogenesis; the repeat experiments are presently underway. But whether or not the molecular mechanism of action of the microdoses is precisely understood at the moment, the positive aspects of the drug, Ars Alb, that make its use less hazardous, are: i) its efficacy in micro doses, and ii) no adverse side-effects or toxic effects of its own when fed to normal controls. As supplying arsenic-free drinking water can not totally rule out chances of arsenic contamination from other sources, the problem of eradicating arsenic related diseases can not be addressed through such effort alone. The results of our earlier and present studies convincingly demonstrate that the potentized homeopathic drug, Arsenicum Album, not only has the ability to help removal of arsenic from the body, but these drugs in microdoses appear to have the ability to detoxify the ill-effects produced by arsenic in mice, a mammal which has close functional semblance to that of human beings. Therefore, the present findings would further add support to our earlier contention that the potentized homeopathic drugs could be strong candidates for effective use in alleviating arsenic-related diseases in the contaminated areas, at least till better facilities can be made available to the risk-exposed people to combat this problem more effectively by some other tested means. Therefore, conducting a pilot clinical trial to ascertain the extent of efficacy, if any, of this potentized homeopathic drug on human volunteers inhabiting arsenic-risk areas of West Bengal (under the joint supervision of scientists and qualified medical practitioners) in combating arsenic poisoning seems to be a relevant proposition worth a serious consideration. Showing mean ± SE of AST and ALT activities and reduced glutathione content in blood and liver of different treatment groups of mice at different time intervals. The authors are indebted to Dr. RPH Thompson and Dr. J. Powell of GI Laboratory, Rayne Institute, St. Thomas Hospital, London SE1 7EH, U.K., for their active involvement and support for this piece of research. Grateful acknowledgements are made to S.P. Sen, retired Professor, Department of Botany, and to G.K. Manna, Emeritus Professor, Department of Zoology, Kalyani University, for their inspirations.